No matter age, gender, region of origin, country of origin, religion, social status, sexual preference, or anything else, everyone has the right to make country music if it’s something that dwells with passion in their heart. Authenticity is not just about who you are, or where you’re from. Sure these things are positive attributes in country music, if you were born and raised in the South or Texas, or did your time on a farm or ranch for example. But the true measure of authenticity is how true an artist is to themselves. Often the ranks of traditional country artists are populated by people who feel like prisoners to their time, out-of-place in the modern context, or enslaved by their native geography. They just don’t seem to fit quite right in their world. But in the realm of country music, everything feels familiar. It’s astounding how far this country music passion can travel, and in the case of Larry Peninsula, it made its way to to Scandinavia, and Peninsula’s home country of Finland where he’s been obsessing over everything tied to traditional country music and the American West for many years. Working tirelessly in his home studio for over three years, Peninsula has finally revealed his debut album Country Music Only. As the name implies, this is no close approximation of American country music. Sure, maybe the foreign accent finds its way through in some of the annunciations, and some use of idiom and language doesn’t translate exactly like it does in country music served in the genre’s native tongue. But what does shine through in stark brilliance is the passion for country music Peninsula and his players exhibit, the studious attention to detail and authentic modes they craft into these songs, and frankly just the overall appeal for the music, regardless of the country of origin. What you’re first astounded by when you cue up the opening title track is how incredibly tasteful the guitar tones come blazing out at you. With all due respect to the North American outfits out there blazing old school country, only a few select folks like Marty Stuart and “Cousin” Kenny Vaughan could match the skill displayed just in the first 20 seconds of the first song. Larry Peninsula went all out to make sure this record was respectful to the sounds and modes of country music from the start, and it doesn’t let up until the end. This is what Saving Country Music first heard months back, placing “Country Music Only” on the Top 25 Playlist when the song was first released. Luckily though, this album’s riches don’t stop there. The second song “Just A Moment In Time” is probably the most contemporary track on the record, and may trip some traditionalists up with the first listen. But it’s also probably one of the best written songs on the record. There are a few songs that are very country, like “Country Music Only” and “Pretty Good Crowd,” but the songwriting is kind of pedestrian. But that is not the case with tracks like “Wastin’ Daylight,” which might be the best effort on the record, or “Cowboy Heart” where Larry Peninsula speaks very directly to being a foreigner stung by the country music bug. Throughout this record, you get a sense of loneliness many traditional country music artists and their fans feel in the modern context. “Where The Rain Is Green” is about dreaming of a place where things make more sense than in the world you’re in, and almost hoping beyond hope to make contact with it. 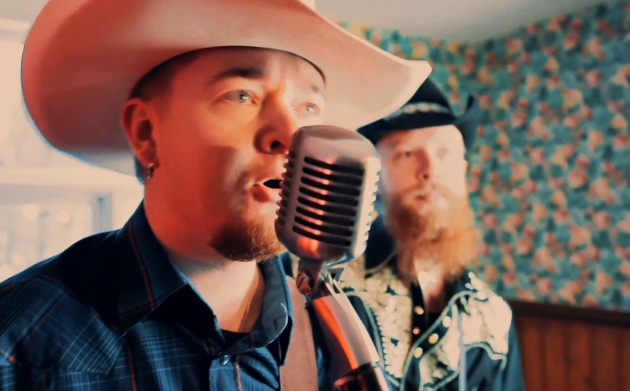 And Peninsula isn’t just inspired by the country, he’s also inspired by Western, which evidences itself in the songs “Dead Renegade” and “I’d Rather Die With My Boots On.” And not to leave his Finnish fans in the lurch, and in a bid to be true to himself, the album ends with him singing and playing a country song in his native language. The musicians who performed on this record also deserve kudos, including Henry B. Jones on bass guitar, Ilkka Jolma on pedal steel guitar, and Heikki Honkanen on harmonica. But Larry Peninsula played all of the guitars and drums on the record himself, which is astounding since the guitar work is one of the principle assets of it. It should be the desire of every country music fan to break down whatever barriers persist in people’s hearts and minds, and let the best and most talented artists rise to the top regardless of who they are, or where they’re from. 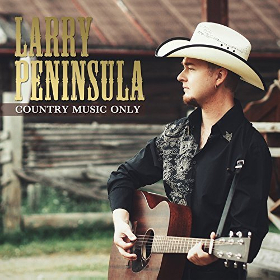 In a just world, an artist like Larry Peninsula and an album like Country Music Only would be reaching everyone with a love of country music in their hearts. Sure, some stuff is lost in the translation. But what is astounding is what is accomplished despite the language barriers and borders separating Larry Peninsula from the origin spot of country music. His passion and guitar work blazes through, and his songwriting holds up in any language. Country music won’t be bordered, and Larry Peninsula is living proof. the tele pickin alone is worth the price of admission . the song VAGABOND is a beauty musically . sad that it takes a bunch of guys from Finland to preserve a beloved American music genre that gets so little respect on its own turf. but thank God they love it enough to do it . Agreed, and tbh I’ve heard the title track a bunch of times (I guess on my spotify discover thing, not sure how i came across it) but loved the sound as soon as I heard it…. I had the title track in the Saving Country Music Top 25 Playlist for a few months. May have been where it turned up. These guys aren’t bad. I can dig it. Man, that guy can play guitar. Excellent. Sending this article onto my Finnish buddy. Thanks for the review! My mom is playing the album in heavy rotation. She is more a fan of 80’s (pop-)country like Dan Seals, Steve Wariner or Earl Thomas Conley. But an album like Country Music Only is the “icing of the cake”. Larry Peninsula released an EP in 2012 called Vagabond with four (more mainstream sounding) tracks. Buried in my playlist is one of the tracks (“When You Said You Don’t Love Me Anymore”). Well…”icing on the cake”. Lol. I ain’t nuts about this song but…I agree it’s got good picking on it and the overall sound is fun. Of course Finland isn’t gonna perfectly replicate country, but it’s nice to see other cultures who like our music. Atlanta! I remember that album when it came out, actually kind of liked it.Oddly enough, the wife and I were out watching live music a few years ago, struck up a random conversation with a guy named Brad who just happens to be the former bass player and vocalist for Atlanta. Nice guy, he’s out of music entirely these days.. He said the band folded because producer Jimmy Bowen lost interest and the label didn’t market them very well. I take it by your handle your a Grisman fan. More a grasser than a country guy? Big fan of Grisman and bluegrass as well as country music but no….the handle is referencing my college football team….the GA Bulldogs. Didn’t care for Atlanta, Little Texas and a few other bands that were popular back then….they sounded to these ears like “Dollywood country music”. No authenticity. I feel the same about Midland. But it’s all good….to each his own. The world would be a boring place if we all liked the same things. I loved that album by Atlanta, especially the song “Sweet was our Rose”. Great band. Pretty sure they had no desire to be Alabama. My personal algorithm-curated playlists by Spotify like the Discover Weekly often will recommend Scandinavian roots music that sonically is identical to a lot like traditional American country. Not surprised at all that he became partial to what we listen to in the States. I want him to write about what’s country in Finland. He does in the final song of this record, and in his native tongue, which I really think helps bring the whole project together. Be damned if I know what it’s about, but it shows that he’s not abandoning who he is to do a country impersonation, he’s acknowledging his foreign relationship with the music. that first song got stale kinda fast, I mean it’s not bad it just didn’t really go anywhere. “wastin daylight” was a dandy. I’m going to start commenting more on these. I do read them, and i’m going to demonstrate that more. because these reviews don’t go unnoticed. this is my preferred content on SCM. I can almost hear Jason Eady or someone similar singing Wasting Daylight. This is like Trigger writing and singing bar songs in Greek and loved Greek bar songs enough to master the bouzouki. Which is fine, but it raises the question of how tied a music is to its people. If you think a music is just a bunch of sounds, the answer is no, there’s no necessary tie at all. But music traditions exist, and those traditions have been carried on by specific people, which creates social histories that complete outsiders, even if they master the sounds, aren’t part of. Right? I think anyone can “learn” any musical style… in theory. for instance, Steve Martin plays really darn good Bluegrass because he’s studied it and listened to it. But Steve Martin is still a rich actor, and that shows through his music, his song titles, the types of songs he writes and plays. It’s great Bluegrass, but it’s not the same Bluegrass that Dailey and Vincent do. This is why Buck Owens’ Country Music is so drastically different than Jerry Reed’s or Roger Miller’s. But a lot of the performers who “defined” what Country Music was, I.E. Haggard, Jones, Cash, and Waylon, had a lot of common themes in their backstories and early lives that bleed through into the common themes into their music. and they are generally regarded as more “authentic” than Owens or Roy Clark, or Patsy Cline. Not that “authentic” is a universally understood bit of terminology. Admittedly though, it would have to take a genuine love of a musical genre to master it as they did (most in the American country scene can’t even be described as having their hearts in it.) We can let em have that. And as evidenced by the songs “Cowboy Heart” and “Saimaa,” Peninsula knows who he is, and isn’t pretending to be a bawn’ & bred ‘Murican. I know that all these Scandi bands are too niche to make it here in America, but damn do they know their country. Between these guys, the Country Side of Harmonica Sam, the Mike Teardrop Trio, and the Ellen Kay Band, the Nordics almost seem to know what good country sounds like more than the heartland of America. Best part of the first song was the steel. Second one sounded real good I thought. Every song is great in their own way. Some might wonder is the album almost too versatile to be country, hah..
My favourite tracks are “Just a Moment in Time”, “Cowboy Heart” and “I’d Rather Die With my Boots on”. Just a Moment in Time has the catchiest guitar and vocal lines in ages. I don’t know if it’s country or not, but it ROLLS. His vocals sound most confident in Saimaa, though. It’s sick that the guy mixed the album on his own! Not to sound like a broken record ( although I’m the first to admit that ship has sailed for me ) one of the big issues with what young America/Canada calls country music is that it has been almost completely undance-able for years . Cut time ‘square ‘ soul-less grooves have permeated the soundscape of this mutation of the genre . Granted , it is changing slightly of late . But Mr. Peninsula and Company get it . Their stuff is not just trad in terms of vocals , themes , arrangements and instrumentation but in the dance-ability factor .And this factor is integral to the success of clubs , honky-tonks and local watering holes where country artists learn and hone their craft . People go there to dance ….and so these clubs have to feature bands that play the dance-able stuff in healthy doses to survive . Here in Vancouver Canada I’d estimate that we probably have 90% fewer country venues than a dozen years ago . I know where-of I speak as I made a living in the ‘trenches ‘ for most of my life and have seen the decline in work for musicians . As the music became less dancer-friendly , less couples – friendly , the bands were booked less , the clubs stopped featuring LIVE music and many have folded completely . The remaining venues DO focus on DANCEABLE country music which translates to ‘classic country’ and ALWAYS attract a dancing crowd , albeit usually older .. So what , you may ask ? Here’s the thing . Rock , Disco ( like it or leave it ) Pop and COUNTRY music all received live exposure and put LIVE bands to work wherever and whenever it was danceable. The artists and their music got lots of work , made money , entertained people on another level and ensured clubs would be open to continue showcasing up and comers and the music . Rock and Pop clubs , along with real COUNTRY , of course , are all but gone in Vancouver with the change in music . Hip Hop DJ’s are hired for ‘ disco-type’ venues …not LIVE bands . Country acts are on summer festival circuits ….not regularly entertaining , promoting the genre and selling product weekly in dance venues, honky tonks and such . OK….I think I’ve beaten this horse into the ground ……I’ll stop now . I think you folks get it . Larry is hitting all the right marks . This is good stuff! Fun, in a nutshell. I found this very appealing. Good, solid, toe-tapping songs and no sign of digital drums, sequencers or auto-tuning (!!! ).